Launceston forwards coach Mike Lewis says his side's poor form in National Two South is "psychological". 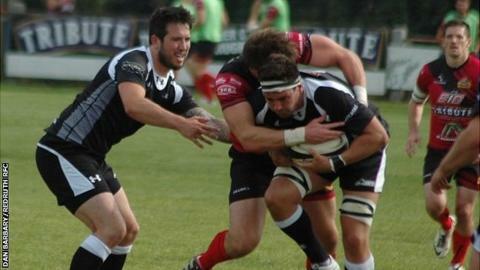 The Cornish All Blacks lost 26-22 at home to Chinnor, despite leading 22-5 at half time. "It's all psychological at the minute, it's how we take that next step forward and that's what we've got to work on this week," Lewis said. "It's something upstairs, it's something we can't put out finger on, but when we do it'll come." It was another bonus-point defeat for Launceston - their fourth this season - as they slipped to fourth-from-bottom of the table with two wins from seven games. The Polson Bridge club have lost their last three matches, with their last victory coming against Dings Crusaders at the end of last month. "I believe in these boys and they believe in themselves, but as a collective we're not coming together as a 15," Lewis told BBC Radio Cornwall. "It's subtle little things. We've got to trust each other, the players have got to trust us coaches and more importantly we've got to win the trust of the fans because we keep throwing away games. "Our game management's not quite there yet, we're not playing the right rugby in the right areas of the field," he added.